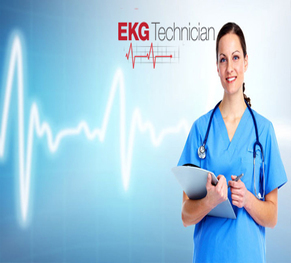 This course is intended to train the students in understanding the techniques and operation of accurate EKG recording. It also teaches the basic principles of electrocardiography of the heart, recognizing wave forms, medical terminology and medical law. We encourage our students to take the national certification exam for becoming a licensed EKG Technician. Students will be taught the major internal and external structures of the heart as well as the major functions of the cardiovascular system. The healthcare industry is growing at a rapid pace creating plenty of job opportunities in Allied Health occupations. Many employers prefer and often require their workers to obtain certifications, they want to know that their employees are properly trained and qualified. Candidates who possess certifications provide that peace of mind. Certification indicates that you have met a nationally recognized measure of competency, demonstrates your commitment to your chosen profession, provide a competitive edge during the job search, may improve your potential earnings, career opportunities and advancement. We encourage all our graduates to certify with a third party agency to increase their professionalism.